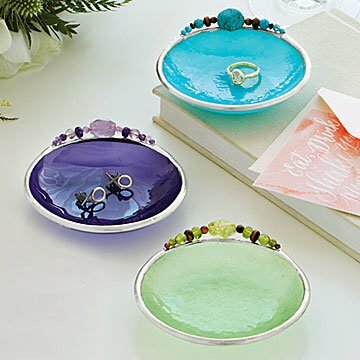 These stained glass bowls are handmade to represent each of the 12 traditional birthstone gems. Birthdays come just once a year, but these decorative dishes by Ellen Bartfeld celebrate the big day all year round. Taking inspiration from traditional birthstones, each dish is carefully handcrafted from stained glass to represent each month's special gem. The catchall is crowned with a line of beads and crystals threaded along copper wire, making an elegant display for your most treasured pieces. Handmade in California. Sold individually. Each mini dish is packaged in a gift box and includes an insert with details about the artist. Ellen Bartfeld describes her creations in simple terms: "Each is made with love." And inspiration often comes from the customers themselves. "I might be asked to find charms that are part of a wedding or bridesmaid theme," says the glass artist, who crafts her wares in California’s Santa Ynez Valley. "Every suggestion is a creative opportunity." Even when her pieces are not personalized, they are still personal. "I envision them on a dresser or by the bed, holding objects that have a special meaning." Wash with water or any cleaning product, dry the soldered rim well with a soft cloth. This is a great gift for any female in your life! Gorgeous! This glass artist's creations deserve 10 stars. They never fail to delight! Highly recommended. A beautiful and personal gift. My sister loved it. I have more sisters, so guess what they'll be getting soon? I had to return this. I do not understand all the good reviews. The dish is small and the beads look cheap. The glass is lightweight and transparent. The trim is sloppy. Not up to Uncommon Goods' usual standards. I will definitely give this gift again! Not only did my friend absolutely love it, her husband insisted they keep it on the table in their entry because it is so pretty. These dishes are so special, unique and beautiful. Very artistic, beautiful and useful. Based on the description and pictures, I was really excited to order this gift (March) for my daughter-in-law for Christmas. Unfortunately when it arrived, I knew I couldn't give it to her - it did not look like a $44 gift. I thought it would be more glassy/shiny/transparent, but it was actually a very dull/opaque dish with some flawed markings on it. And a bit tinier that I expected.